The most controversial aspect of IEX’s proposed design seems to be the non-uniform application of their speed bump. Before the community invests too much time debating this issue, I want to discuss why the unfair access proposed by IEX is unnecessary. IEX could accomplish their stated goals without offering an informational advantage to its peg orders or router. If re-ordering messages with software during the shoebox delay makes the delay appear more “intentional” (which violates Reg. NMS), there are analog options too. IEX could introduce smaller shoeboxes for the direct feeds it processes. For example, if IEX receives market data messages from Nasdaq 200us before any trader can act on them, then it can add a delay coil of 200us to its cable from Nasdaq. And, if it receives market data from NYSE 50us before fast traders do, then it can add a 50us coil to its NYSE feed, etc. IEX says that it delays outgoing messages to all subscribers, except their routing broker-dealer (IEXS), “to prevent “information leakage” or “liquidity fade” when IEXS routes to other markets.” Their concern is that, without this asymmetric delay, market-makers could pull their quotes on other exchanges if a trader sends a large order to IEX which partially executes before being routed out. However, IEX could prevent that “front-running”  by locating its router outside the speed bump in Secaucus, with clients. The router could then maintain its view of exchanges’ visible order books, including IEX’s, and time the sending of its orders so that they arrive at all exchanges simultaneously. What ColorBook did with the hidden orders is route its customers to those hidden orders… Once they submitted an order to buy X shares at Y price, ColorBook would send it toward the hidden orders. That’s exactly what you want when you submit a hidden order! The argument to allow IEX to favorably treat its router is pretty much the same as Levine’s point about Lava. Such treatment, if fully disclosed, would probably improve fill rates for users of both the router and IEX hidden orders. It does, however, hurt users of non-IEX routers (and non-IEX resting orders, which miss fills). The question is whether exchanges should be permitted to help their users via any means, or whether they have to consider the broader competitive landscape. Should BATS be permitted to make routing decisions based on special access to Edge’s hidden orders? The same trade-offs apply. This post, as always with IEX, is speculative. Their currently posted exchange application doesn’t have much information on the speed bump and when it applies. IEX’s comment letters provide more detail, but there are still some uncertainties in my mind as to what exactly their market model entails. IEXS, the routing broker‐dealer, does not route to IEX and all orders, routable or otherwise, must pass through the POP, so there is no competitive disparity in terms of access to IEX’s trading system. IEX favorably treating its router could prompt other exchanges to create similar arrangements for their own routers, putting brokers’ smart order routers and small exchanges at a competitive disadvantage. I don’t really understand why IEX would want that to be permitted. If a larger exchange like Nasdaq were to introduce a speed bump that doesn’t apply to its router, traders would be strongly incentivized to use Nasdaq’s router, and nobody would use IEX’s. I’d think that a startup exchange would be most supportive of Reg NMS’s spirit of fair competition. IEX’s peg order treatment could raise questions about fair competition as well. Traders and brokers may be forced to use IEX’s algorithmic order types rather than their own. Citadel expressed concern that IEX could one day “charge more to execute pegged orders… that have an inherent time advantage over other order types.” And perhaps IEX already does — by charging a higher rate for hidden orders. My understanding is that all hidden orders on IEX are effectively midpoint pegs which are repriced using non-speedbumped market data. It’s not unusual for an exchange to charge extra for hidden executions, but providing a latency advantage to hidden orders raises new questions about their fees. For example, if IEX receives a book update from Nasdaq at 10:00:00.000000 over fiber with a 1-way latency of 200us, but they know the fastest wireless link has a 1-way latency of 100us, then IEX could recalibrate the timestamp of that book update to 9:59:59.999900. That would represent the time that the fastest trader could have received the same market data message (100us earlier than IEX). There are some wrinkles when you consider that wireless links are not always operational, so if IEX were to be completely fair it would not perform this subtraction when the weather is bad. Rather than deal with that issue, it may be easier for IEX to just subscribe to wireless feeds from the most important markets. It’d probably cost a total of around $50k/mo, which doesn’t sound like a big burden. I don’t see why it should matter whether a delay has software components, but I’m also not a lawyer. Or whatever they’re calling it these days. Though I don’t understand the extent that an exchange can act in a broker-like capacity. Perhaps locating their router in a different datacenter and offering functionality similar to brokers’ smart order routers (SORs) crosses some line? If so, that still seems better than their proposal to offer systematically-advantaged SOR-like functionality? 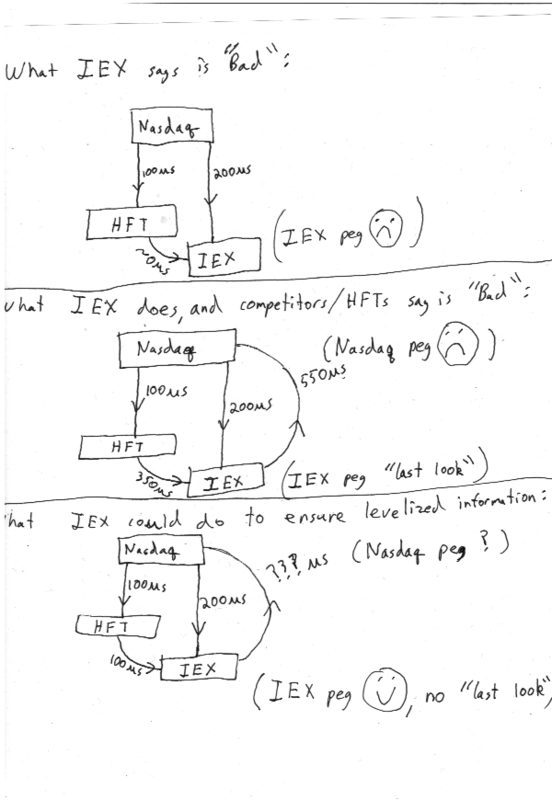 IEX seems rather dismissive of sequential routing in a comment letter (p16). But sequential routing does have its advantages. Not every user wants to fully access lit quotes without regard for market impact, price improvement, or fees. While it is not explicit in the Application, IEX has explained informally that the IEX Router would not be required to go through the IEX Access Delay to access the IEX trading system or when routing orders from the IEX trading system to other market centers. There’s also an argument that allowing the IEX router to skip the speed bump guarantees that any unfilled portion of a routable order will be first in the queue when it returns to IEX. Ignoring the issue of whether IEX should be able to offer this benefit only to clients of its router, I don’t think it’s actually true. I don’t know exactly how IEX’s router works. But if it submits orders so that they hit BATS at the same time as NYSE, it should be possible for a trader to react to the sweep on BATS and submit an order to IEX more than 350us before IEX hears back from NYSE. Matt Levine is responsible for creating the pun. I’m responsible for using it badly. This entry was posted in Uncategorized on December 18, 2015 by Kipp Rogers.